Get you a stan like Kevin Keller. Riverdale's Betty Cooper is known for two things: her girl-next-door persona and her iconic ponytail. In Riverdale season 2 episode 4, "The Town That Dreaded Sundown", Betty's ponytail gets a massive ego boost courtesy of Kevin Keller. 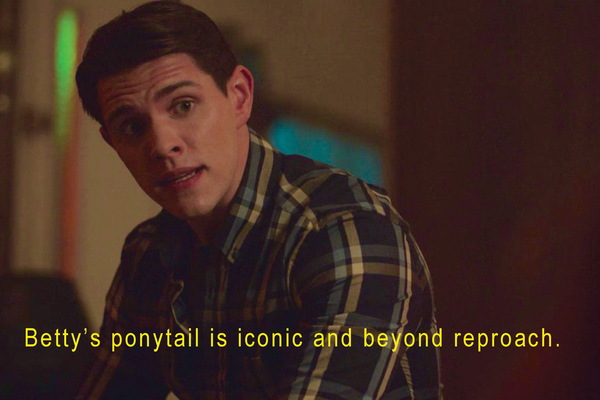 When Toni Topaz boldly suggests that Betty should "loosen" her ponytail, Kevin Keller offers up the wildest piece of dialogue we've ever heard him say. Okay, true but let's bring it down a notch, Kevvy. Naturally, everyone is OBSESSED with Kevin standing up for Betty's "iconic" pony. Truthfully, Betty's ponytail IS beyond reproach and she's lucky to have a friend like Kevin who is ready to throw hands at the slightest bit of shade. Could this be the infamous Toni/Betty feud we've all been waiting for? Let that be a lesson, Toni. Don't come for Betty's pony unless Kevin sends for you.